"He's frightfully rude, isn't he?" Agatha Christie's character of Miss Marple has endured as one of her favorite amateur sleuths. It's easy to see why when one considered the morbid humor and sly wit behind the idea of a classy, elderly, British woman solving hideous murders. How does she do it? Well, when one sits quietly and anonymously enough in the midst of modern society, like Miss Marple does, you manage to pick up some unsavory experience with humankind; just enough knowledge and observance to know who's a bad egg and who isn't. In A&E's latest entry into the 'DVD Classics' series, Agatha Christie's Miss Marple appears in four complete mystery programs from the BBC. Up first is A Caribbean Mystery, which sees our Miss Marple vacationing in the West Indies. Content to simply sit alone on the beach and do her knitting, she finds herself dragged into the circumstances behind the unexplainable death of an important Major staying at her hotel. Though everyone assumes he's died of natural causes, a particular maid believes otherwise and shares her theories with Miss Marple who, in order to relief her boredom, decides to investigate a bit on her own. Was it murder? Certainly there are enough suspects around, but the problem is there may be too many since virtually everyone has a motive; even poor Miss Marple who was bored to tears by the Major's stories! One of the highlights of this mystery is the role of the tyrannical, grouchy, industrialist as played by Donald Pleasance. In The Mirror Cracked From Side To Side, Miss Marple is enjoying some quiet time with friends in the English village of St. Mary Mead. Things are stirred up a bit, though, when famous movie starlet Marina Gregg comes to town and throws a huge party. The whole town is invited to the celebration at her new manor, but when someone dies from a poison drink that was seemingly intended for Marina, Miss Marple puts here wits to the tests trying to figure out the motive. Could it be adulterers or scheming cast members in her new picture? In a more unusual and supernatural vein, Sleeping Murder introduces us to the couple of Gwenda and Giles Reed who have just moved into a new house. Unfortunately, Gwenda is racked with hallucinations of a dead body lying in their hallway. Her strange visions provide Miss Marple with enough clues that she determines the ghostly body to be an image of one of the previous tenants, Gwenda's stepmother. Marple treats it as evidence of her past murder, and sets out to uncover the answers behind a decades-old crime. Her efforts will, however, meet resistance from strange places. Finally, 4:50 From Paddington sees Miss Marple encountering a woman on board a train; much like her, she's an observant, sharp person who claims she saw a strangling in a passing train. Miss Marple takes the claim seriously and follows a trail of clues to a wealthy, grim family known as the Crackenthorpes. Obviously such menacing and secretive people have something to hide, and so it must be uncovered, but doing so sounds easier than it will be for Miss Marple. The Miss Marple mysteries adhere to wonderful standards of drama and crafting, so as to be very entertaining, but not quite the usual television fare. Since each of the shows is around two hours, there's a lot of time in which the filmmakers can develop characters, enrich the story, and improve the atmosphere. The result feels complete and whole, as if nothing was rushed or pushed aside. The BBC seems great at casting as well, since most of the roles are so well filled by actors that really seem to embody their characters. The late Joan Hickson is perfect as Miss Marple, and was supposedly Agatha Christie's own choice for the role back when the two were involved in a play together. Unfortunately, Christie did not live to see Hickson literally become Miss Marple, but she takes the weight of such a heavy literary icon and carries it well. I'm not sure how A&E came to choose these 4 television movies for the set, but they seem to be good picks in terms of content. Like any good Christie story, they teem with quirky characters and unusual situations, offer the viewer a wide choice of faces on which to place bets as to who the killer is. Also, like any good filmed drama, the on-location shooting also helps the narrative along by placing everyone in the right setting. While some prefer harder-edged mysteries, maybe the type to feature Hercule Poirot or Sherlock Holmes, Miss Marple's quandaries are no less dastardly or brutal. She seems able to easily hold her own even against the most savage murderer, and that's part of her charm. Image Transfer Review: Working with what seems to be very poor source material, the transfers are, in many aspects, very poor, dipping in and out of 'D' grade level. There is almost constant, very obvious pixelization and compression artifacts in virtually any moving object. In fact, if you've ever wondered what exactly heavy compression artifacts look like, here's a prime example. I would imagine the severe grain on the original sources bring out most of this and, despite a relatively high bit-rate, each episode is simply awash in movement and shimmering of all sorts. Scenes that are brighter tend to improve, but the darker things get, the worse the visuals becomes. Luckily, no one tried to cover up these problems with further 'solutions' like edge enhancement. The discs are not unwatchable, but this is not DVD quality. Audio Transfer Review: A basic Dolby Stereo track is provided, but it sounds surprisingly clean and clear when compared to the video. All sound and dialogue is directed to the center channel, while the musical score gets some stereo treatment. As the shows are primarily of a calm nature, there really is no directionality or wild bursts of sound. Index of all Miss Marple stories. Extras Review: The only additional feature is a text index of all Miss Marple stories and novels. On the positive side, there are plenty of chapter stops and the presentation, though simplistic, has a nice, quiet, dignity to it. 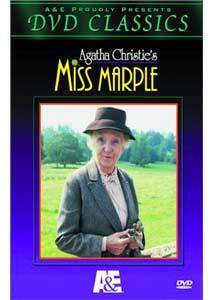 Although not a demonstration of the advantages of DVD, mystery fans might want to pick up Agatha Christie's Miss Marple for a healthy dose of strange deaths, distinct characters, and the sharp wit of a master detective.